Chief Minister Naveen Patnaik inaugurated the flyover at Rajmahal Square on Wednesday. The dominant six-lane structure that now connects Kalpana Square with AG Square will make traffic jams a thing of the past. Similarly, shortcuts between Rajmahal and Unit 1 market on one side and the Unit II market building on the other have been completely closed down by the flyover. The impact of the flyover on the traffic in and around Rajmahal was visible by evening. A seamless flow of traffic from Ashok Nagar towards Bapuji Nagar was the characteristic feature of the day. Though the ride on the flyover itself may not be as smooth as the flyover at Jaidev Vihar, the six lane flyover will cater to only those wanting to reach AG square from Kalpana Square or vice-versa. 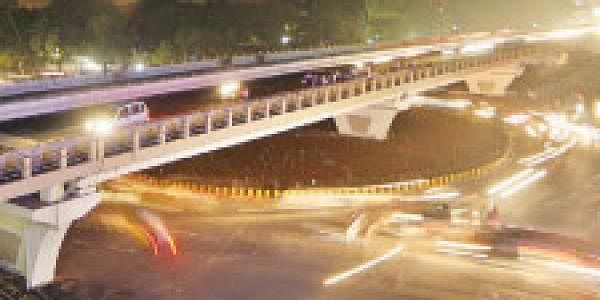 “The flyover will be instrumental in streamlining the traffic in the near future,” said Mayor Ananta Narayan Jena. The flyover was supposed to be complete by June 30, but the deadline could not be met due to problems like encroachment. Finishing touches like providing grills surrounding the flyover are still underway. The flyover measures 560 metres and has been constructed at a cost of ` 35 crore. According to sources, another flyover that is being constructed at Vani Vihar will be completed in 2015.